NEW HAVEN, CT, March 20, 2018 - How happy are you? Have you seen a dentist lately? Are local government officials responsive to your needs? Those are just a few of the questions being asked by friendly survey-takers helping DataHaven and dozens of leading community and charitable groups throughout Connecticut complete what is believed to be the largest neighborhood-level well-being survey in the United States. 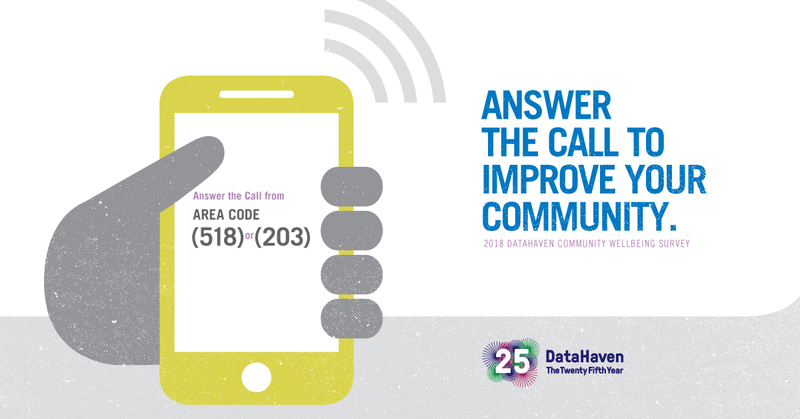 A record number of participants will pick up the phone and complete an interview - over 15,000 by the time the 2018 DataHaven Community Wellbeing Survey is complete. "Our initial feedback from residents and our previous experience with this survey shows that people like to answer these questions," says Mark Abraham, Executive Director of DataHaven. "They are answering questions about their own happiness and health, their family's financial security, and how their communities and neighborhoods are faring. These questions show that we care about how they feel." DataHaven, the nonprofit group leading the collection and study of neighborhood-level public data on key social and economic indicators, announced the first statewide Community Wellbeing Survey in 2015 (see https://www.ctphilanthropy.org/news/datahaven-announces-completion-largest-ever-survey-neighborhood-level-quality-life-health-and). The 2018 Community Wellbeing Survey will allow unprecedented tracking of regional and local trends over the past three years, as well as create an even more in-depth portrait of Connecticut’s neighborhoods, when updated results are shared this fall. After seeing the impact of the 2015 survey results, over 75 of Connecticut's leading hospitals, government agencies, and charitable organizations have decided, once again, to support the 2018 Community Wellbeing Survey with major donations. Supporters joining DataHaven include regional community foundations, United Ways, and health care providers located in Hartford, New Haven, Bridgeport, Stamford, Waterbury, Norwalk, Danbury, New Britain, Greenwich, Meriden, Middletown, New London, Derby, and other cities and towns. Residents throughout Connecticut and several areas of New York State will receive phone calls from survey-takers at the Siena College Research Institute - generally appearing as a 203 or 518 area code - beginning this month. Calls continue this spring and summer. 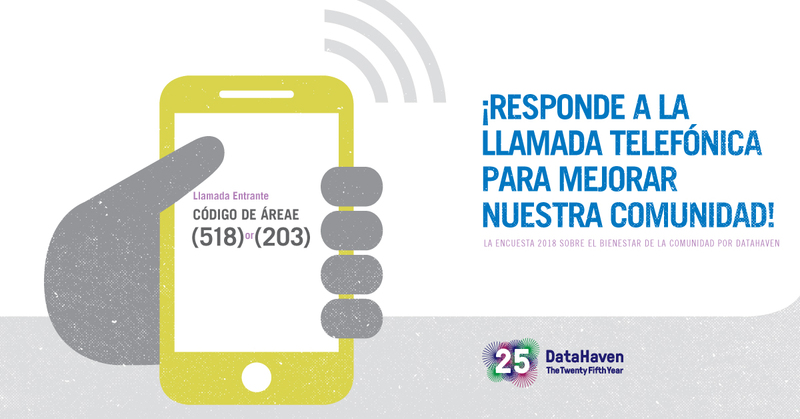 DataHaven's 2018 Community Wellbeing Survey implores residents to, "Make a difference: Pick up your cell phone or home phone, help your community learn more about your needs, and tell us what you want to see to promote greater happiness and well-being in your neighborhood," says Abraham. Unlike most statewide and national surveys, the DataHaven program brings together grassroots efforts across the state - effectively unifying dozens of existing regional surveys into a single, exceptionally high-quality program that covers the entire state. The mission of the initiative is to produce reliable neighborhood-level information on issues that are most meaningful to local residents, and to foster collaboration between the hundreds of organizations, institutions, businesses, and agencies that are working to build stronger communities. This nationally recognized program provides neighborhood- and regional-level information not available from any other source on community vitality, health, family economic security, and individual happiness. Other topics such as civic engagement, transportation, housing, and employment - even satisfaction with government and community life - are included. "We believe the 2018 Community Wellbeing Survey, the most comprehensive local-level survey of its type in the United States, will continue to be of great value to neighborhoods and organizations striving to make our cities and towns even better places to live and work," says Abraham. • In Fairfield County and the Greater Danbury area, organizations including Fairfield County's Community Foundation, Greater Bridgeport Primary Care Action Group, Stamford Hospital, Greenwich Hospital, Western Connecticut Health Network, Newtown-Sandy Hook Community Foundation, United Way of Coastal Fairfield County, United Way of Western Connecticut, Norwalk Health Department, City of Stamford, and the City of Danbury are funders. • In the Greater New Haven and Naugatuck Valley areas, funders include The Community Foundation for Greater New Haven, Connecticut Community Foundation, Valley Community Foundation, Yale New Haven Hospital, Griffin Hospital, Waterbury Hospital, Saint Mary’s Hospital, Carolyn Foundation, City of New Haven, City of Waterbury, Town of Wallingford Health Department, United Way of Greater New Haven, United Way of Greater Waterbury, Milford Health Department, Gaylord Specialty Healthcare, Greater New Haven Green Fund, and others. • In Greater Hartford and New Britain, the program has drawn support from the Hartford Foundation for Public Giving, Saint Francis Hospital and Medical Center, Hartford HealthCare, Johnson Memorial Medical Center, City of Hartford, Central Connecticut Health District, Trinity College Center for Urban and Global Studies, Capitol Region Council of Governments, Hospital for Special Care, and others. • Additionally, DataHaven has secured funding to ensure that residents of Connecticut's smaller cities and rural areas are included to the same degree as those living in its major metropolitan areas. Support has been committed from organizations including Connecticut Health Foundation, Lawrence + Memorial Hospital, Ledge Light Health District, Middlesex Hospital, the Community Foundation of Eastern Connecticut, Eastern Highlands Health District, Planned Parenthood of Southern New England, Pomperaug Health District, Liberty Bank Foundation, the Foundation for Community Health Fund of the Northwest Connecticut Community Foundation, the Meriden Health Department, Day Kimball Hospital, and Northeast District Department of Health.